Mitsubishi is well known for its presence in the pick-up truck arena, offering one of the most capable on and off-road vehicles available on the market in the L200. Now in its fifth generation, the L200 has been reborn into a true workhorse, though with an extra dose of interior sophistication, meaning that it could even appeal to SUV drivers looking for an impressive all-rounder. Since the first model hit the roads 33 years ago, the L200 has been labelled as one of the most practical pick-ups in the class as well as being one of the most affordable. Branded as the truck that is capable of safely transporting the children to school and climbing mountains on the weekend, the L200 once made up a hefty 70 per cent of the total market place. 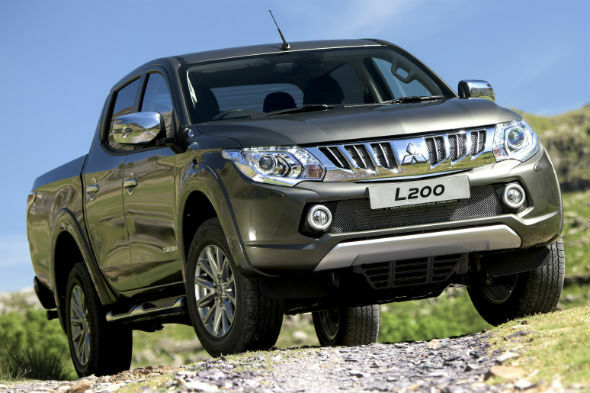 Today, the L200 continues the legacy set by its predecessors, only it now comes with more gadgets and boasts class-leading fuel economy, performance, and manoeuvrability according to Mitsubishi. The latest version is clearly derived from the previous model that came out in 2006, but there are more changes on offer than meets the eye. Mitsubishi is offering the new L200 with a new all-aluminium 2.4-litre diesel engine, which is the first in the class to offer variable valve timing, giving it some extra muscle. The lightweight unit, coupled with an overall reduced vehicle weight of 30kg, means the L200 offers 20 per cent greater fuel economy than before with a figure of 42.8mpg – 4.1mpg more than its closest rival, Isuzu D-Max. Emissions, meanwhile, weigh in at 173g/km. The new powertrain also features a clever new turbocharger, which, in basic terms, feeds more power to the wheels at low engine speeds and provide smoother responses at higher engine speeds. Mated to a new six-speed manual or a six-speed automatic with paddle shifters – a first for a pick up – the new engine pumps out 178bhp – enough to power it to 62mph in a brief 10.4 seconds. Available in four recognisable trim levels, bookended with entry-level 4Life and range-topping Barbarian trim, the L200 is crammed with gadgets and safety aids. The 4Life, which is available from £19,749, gets a range of luxuries as standard including keyless entry and daytime running lights along with air-conditioning, alloy wheels and cruise control, while the Titan adds a stop/start system, a digital radio, tinted windows and larger 17-inch alloys for an additional £1,000. Move up a step (and another £2,300) to Warrior trim and you'll be spoilt rotten. As well as the kit list from the Titan, it receives heated seats, sat nav, a reversing camera and xenon headlights. Meanwhile, the range-topping Barbarian model – £23,799 or £25,199 in automatic guise – is crammed with extras such as puddle lamps and a soft-opening tailgate damper, as well as LED mood lighting and a leather interior. Mitsubishi has done away with the hill descent system, but the L200 does feature a hill start assist systems, a lane departure warning and trailer stability assist, which can handle towing loads of up to 4,090kg. The pick-up segment may not offer much competition, but buyers still have several models to choose from. The L200's biggest rival is the Isuzu D-Max, but when it comes down to comfort and interior design, there's no competition. Ford's Ranger is also high on the list, which may be slightly more attractive to our eyes than the Japanese Mitsubishi, but has a higher price tag and offers less equipment. This is a similar case with the Toyota Hilux, which has an entry price of £21,255 – more than £1,500 pricier than the L200 4Life. The L200 has been dubbed the utility workhorse for the road, with the performance of an everyday SUV. It can comfortably cart passengers on long-distance journeys, thanks to its spacious cabin and minimal road noise, but it's also at home through boggy terrain. Pick-ups can be a lot to handle on the open road, but the L200 is equally as happy around town as it is in the mud. It even has a reasonably tight turning circle. Gone are the days when the engine in the L200 used to chatter and the ride was jittery. The clutch feels lighter and the gear changes are smoother. But it still feels suitably tough and sturdy from behind the wheel. The L200 no longer suffers from severe body roll either and feels notably sharper in the corners; it's not a car you'll be throwing into bends, but you'll certainly feel safe should the roads get twisty. It's also surprisingly responsive to accelerator inputs. Unlike most pick-ups, the driver can switch between two and four-wheel drive at speeds of up to 62mph and with all four wheels engaged, the L200 is a safety device in its own right offering a secure hold on the road. Mitsubishi's aim was to turn its top-selling pick-up into a multi-purpose road car, and that's exactly what it's done. The firm has built on the foundations of its rugged utility vehicle and created a versatile warrior, capable of ploughing through mud or around the M25, while providing a smoother ride, a more attractive interior and greater fuel efficiency at the same time. Mitsubishi has attempted to combine the characteristics of an off-road machine with a family-friendly SUV – an we'd say it's onto a winner with the L200.